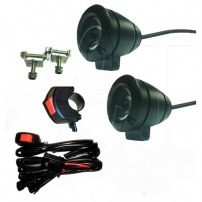 Bluhm Enterprises has designed a complete light kit for motorcycle and trike applications. The kit is complete with a pair of your choice Show Chrome or Matte Black LED round bullet lights, wiring harness and handlebar switch. The kit is designed to be a great addition to any street bike from a classic to a rocket. 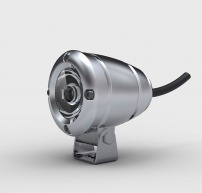 2.0" round compact design and super bright 10w. CREE LEDs in each light. Kits are packaged in a full color box with instructions for easy installation. Here is a good side angle of the light. Spun Aluminium housing for super smooth and clean surface. 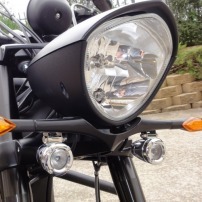 Here is a picture of the Chrome Bullet LED lights on a Dual Sport Bike.